Shen's News: Since I was in Japan last in May 2012, my life has been transformed. This week I'm looking forward to coming back to Japan for a few weeks with my lovely wife Yuki and our beautiful baby girl, Saraswati. I'll be doing 8 concerts in Tokyo, Nagoya and Kansai, including a couple with Yuki as well as many more old Indian classical music friends around Japan. I hope to see you and introduce my new family. Shen's News: I'm now back in Australia so just wanted to write and say a big thanks to all my friends in Japan for your support again this year. I've posted some more blogs about my Japan tour so please take a look. I'll be back next year in April and May. Shen's News: I have just 2 more weeks and 6 more concerts in Japan this year, before returning to Australia on Sep 13. I'll be performing with a bunch of different friends in Kamakura, Tokyo and Gifu. Please see the list below. Sat 9/10 Gifu: 14th Indian music and dance Sangeet Mela in Horado GIFU - FINAL!!! Shen's News: We're most of the way through Tenzin's Japan tour, just Nagoya, Osaka and Kobe to go. The music has been just fabulous, not to be missed. The official tour home page is at http://tenzin.cocolog-nifty.com/ and you can also share our tour info with your friends via our Facebook tour page. I'll be back in Kansai on 20th/21st for concerts with Tadao Ishihama and Yasuhiro Minamizawa. Shen's News: Tenzin and I are very excited to be coming to Japan just next week. Thanks to great musician Taro Terahara we have a full schedule of concerts all around Japan including Gifu, Kyoto, Kobe, Osaka, Kamakura, Niigata, Saitama and all around Tokyo. The official tour home page is at http://tenzin.cocolog-nifty.com/ and you can also share our tour info with your friends via our Facebook tour page. Tibet2Timbuk2 news: Our CD "Music is Life" is now available for download in high quality format from the EthnoSuperLounge Shop. Proceeds go to support Tibetan Children's Village. If you've heard it and like it, please check out 20 easy ways to help Tibet2Timbuk2. Shen's News: Once again it's been ages since I've written. 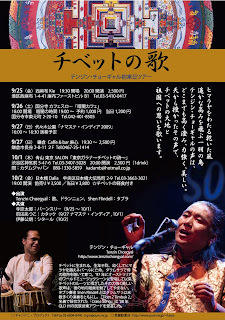 Plans for my Japan tour with Tenzin Choegyal and Taro Terahara Oct 19-Nov 16 are progressing well - details next time but you can check our website events calendar any time. Of course I've been blogging about my activities all year; full list is below but some highlights are: my Tabla School Concert, Vinod Prasanna tour, Tibet2Timbuk2 in Hervey Bay and Eumundi. Shen's News: It's been absolutely ages since I've written to Japan, I'm very sorry. Since I last wrote, I've returned from Japan, toured with sitar-vocal duo Debapriya-Samanwaya, gone to India, had lessons with Govinda Chakraborty and Pt Nayan Ghosh, played with Taro in Delhi, returned to Australia, played with Jai Uttal and most recently Sangeet Mishra (sarangi). If you'd like to check out some nice photos or read about these adventures and more, please visit my blog. I'm planning to visit Japan this year in October/November! Volunteers needed! to add events to the ESL Japan calendar. If you'd like to help spread the word about world music events, please let me know. It will take a few minutes every few days. Shen's News:Last days in Japan, such a wonderful time. In the last few days I was blessed to accompany Steve Oda, 35 years' sarod student of Ustad Ali Akbar Khan, twice. Blogs coming soon, I promise. From previous weeks, I've posted photos and stories about Tenzin's tour of Japan: parts 1, 2 and 3, plus Gifu Sangeet Mela 2009. Tibet2Timbuk2 news: "Daway Wola" recently won "Best Fusion" at the Music Tibet Awards! We have entered a few songs in the 2009 National Musicoz Awards - please follow the link to vote for us! In other news, our CD "Music is Life" is now available for download in high quality format from the EthnoSuperLounge Shop. Proceeds go to support Tibetan Children's Village. If you've heard it and like it, please check out 20 easy ways to help Tibet2Timbuk2. Shen's News: Well, Tenzin has come and gone and Japan will never be the same again. :-) Slight exaggeration, but we had a really great time and he made a huge impression on everyone who came to our shows. It was a really great experience for me to be play with Tenzin almost every day for a week, and along with bansuri player Taro Terahara we developed a really tight act. As usual I'm a bit slow on the blogs, but in the meantime you can see "Tenzin in Japan" photos on Facebook. I have one last round of shows in Tokyo this week, starting with Yoshida Daikiti tonight in Shibuya and tomorrow in Shinjuku. Indo-Sai on Saturday should be a fantastic event, featuring Steve Oda on sarod and Amit Mishra on tabla. Kirtan with Yuki on Sunday then my finale event with Taro Terahara and Steve Oda at the beautiful Gen-Shin-An on Monday. Have you got your copy of Tibet2Timbuk2's new CD "Music is Life" yet? It's a great CD, so please check it out at the EthnoSuperLounge Shop. Proceeds go to support Tibetan Children's Village. Shen and Marcello at "Sing it Up for Sabina"
Shen's News: I had a quiet time seeing a few friends in Nagoya and Kyoto last week, but now it's time this tour got serious. I have 15 shows in the next 19 days, mostly in Tokyo! My show with Hide Iwai tomorrow night is sold out, but be sure not to miss my good friend, Tibetan singer Tenzin Choegyal who arrives on Thursday for a series of shows starting Friday. I've been dreaming of bringing Tenzin to Japan for years. Not to be missed, everybody!!! Great review of Tibet2Timbuk2's "Music is Life"
Is Social Search Here for Primetime?